Gwen Thomas, founder of Fresh Perspective Seminars, addressing an audience of 400 families. Detroit, MI -- Black Friday now takes a different spend for some families with college-bound students in Detroit, instead of going shopping and spending money, this year nearly 400 families made their way to Charles Wright Museum of African American History for "The Black Friday Scholarship Bootcamp" to learn how they can stay in the black, by saving money for college. Moreover, getting on track to win scholarships to pay for college instead of getting in debt. The Black Friday Scholarship Bootcamp, created 5 years ago, aims to increase awareness of the perils of college debt, bridge the global academic and financial college readiness divide for students of color across the globe to lead students to a successful pathway to college. The program is the brainchild of Gwen Thomas, author of The Parents Smart Guide to Sending Your Kids to College without Going Broke. She comments, "We are providing resources for students and parents to utilize and leverage opportunities that can lead to scholarships, internships, fellowships, and sustainable careers. Essentially, we are attempting to partner with corporations, community groups and families to produce the next generation of competitive talent that will make a significant contribution to corporations and society." Michigan is ranked number 11 of the 50 states and districts with the highest amount of student debt coupled with a default rate of 13%. This year, The Black Friday Scholarship Bootcamp welcomed professional speakers from across the country, representing numerous career tracks. Dr. Jacquelyn Gardner Wilson, pharmaceutical research at Pfizer Corporation headquartered in, Aaron Parker, renewal energy at Consumers Energy, Natasha Morris, Municipal Water Systems at Washington Suburban Sanitation Commission, Dr. Renee Matthews, medical field Gynecology/Obstetrics and Medical Media Personality and Hakim Berry, Human Resources, City of Detroit. Financial literacy partners included Todd Bradford of TCF Bank, Anne Harpe PNC Bank followed by FAFSA expert Maxine Hudgins. The conference culminated with a all-expense paid giveaway of 4 HBCU College Tours for next spring, a presentation from Fulbright Foundation to discuss opportunities for graduate and postgraduates to fund their fellowships, study and work abroad. Fresh Perspectives also welcomed The African Impact, whose international virtual presentation excited many in the audience. "The information shared today was invaluable. I learned that college tuition is one of the largest expenditures a person will make aside from purchasing a home. Gwen Thomas is helping so many families because I did not understand the depth of financial planning necessary for college," says Chrystal Rishon a mother of a high school senior. The goal of Fresh Perspectives organization is to help families realize that there are alternative ways to pay for college-like scholarships to funding college or reduce college debt, whether they have zero income or a six-figure income. 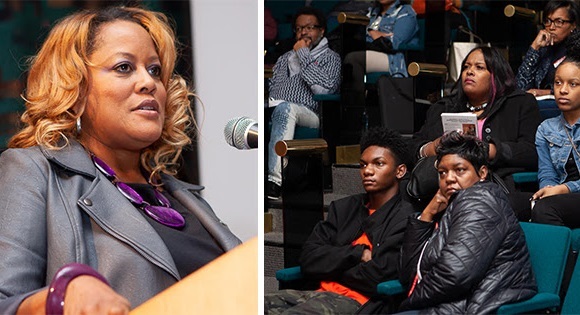 Fresh Perspectives Seminars located in Washington DC and Detroit produces the annual Black Friday Scholarship Bootcamp, Pursuing The Dream Scholarship Bootcamp and other related seminars across the globe. The agency publishes books, holds college coaching sessions and has helped student win $7 million dollars in direct scholarships and travel abroad to nearly to 100 countries. Thomas has worked with students in Vietnam, Trinidad, Mexico, South Africa, and Honduras. For more information, visit www.freshperspectivesseminars.org or contact Fresh Perspectives at 609-474-4877.